Ninja Joe Pork Burger Fast-Food Restaurant was the first non-halal fast food restaurant in Malaysia. 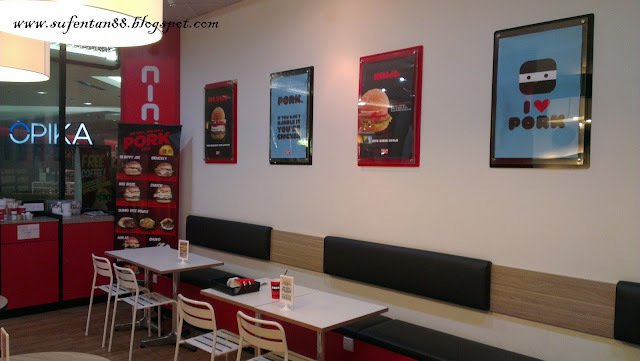 I still remember 6 years ago when they first started in Tropicana City Mall, we were so excited that we could have a fast-food restaurant that sells pork burger in Malaysia; however, I only tried once since they started. Their marketing concept was based on volume sales: the more burgers you purchase, the cheaper the price per burger will be. In my opinion, it seem like the concept didn't work out. The price and the size of the burger (very small) doesn't seem to match at that time, where else Mcd and other burger fast-food restaurant were giving far more better deals. After 6 years, more and more pork burger restaurants are coming out. More pork burgers are selling like hot cakes now. This time, I decided to come back here to give it another try. 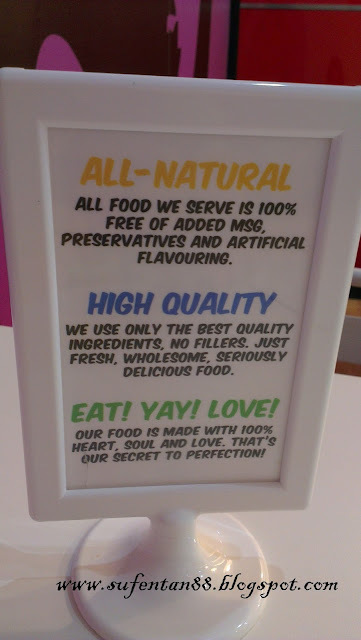 It seems like they have change their marketing concept and is more similiar to the likes of Burger King. 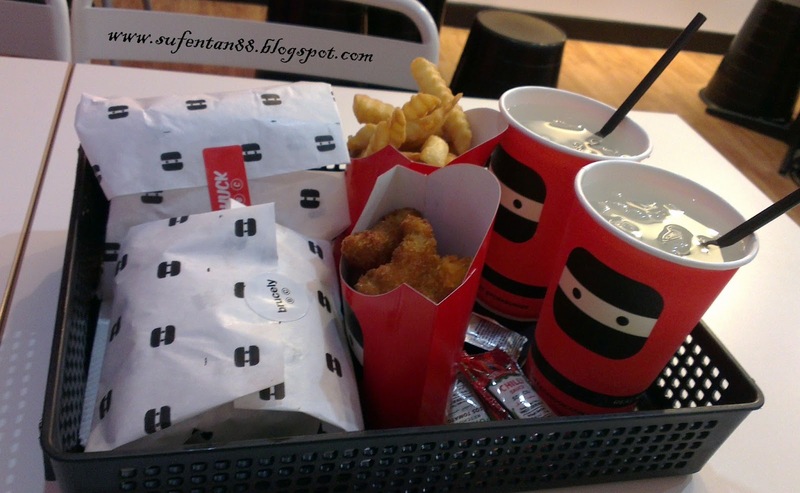 I have ordered a Chuck set meal and a Brucely set meal that come with a french fries or shurikens and a drink. Chuck Burger comes with minced pork patty with bacon, cheese, egg, onion, tomato, lettuce and onion rings. 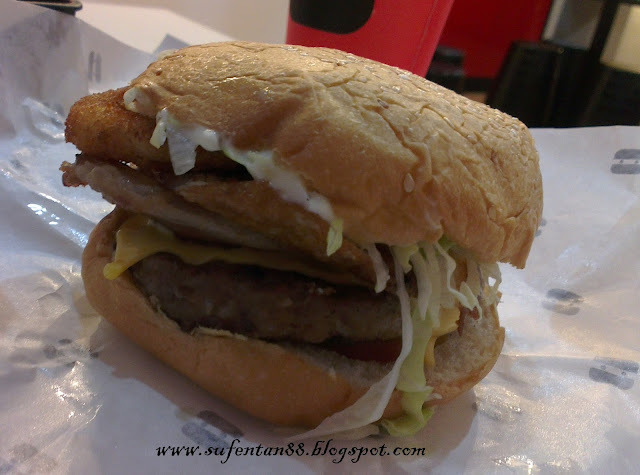 Although the size of the burger looked quite small to us, however it tastes quite nice surprisingly. Don't judge this little thing so fast, 'cause we actually found ourselves to be quite full after chomping this small piece. The burger comes with pork chop patty with bacon, cheese, lettuce and tomato. This pork burger is slightly smaller than Chuck. In addition, the taste wasn't as good as Chuck but it is still acceptable. Overall, the taste was normal, I think the burger bread should be changed to some sort of a special bread if they want to compete with the competitors. 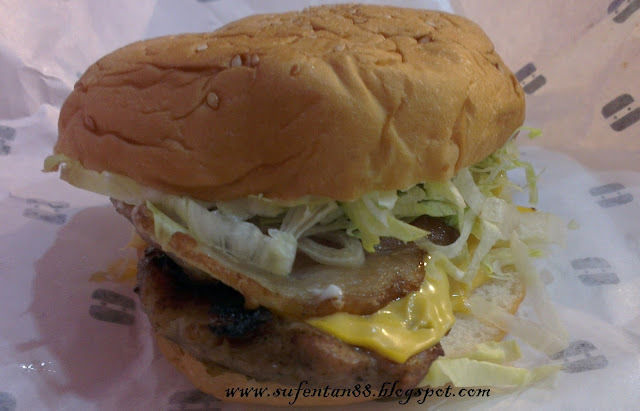 More and more pork burger restaurants are coming out and they serve way better pork burger than ever before. With that price and quality, I could get a much bigger and delicious pork burger. I guess they need to revise their prices to catch more customers.